The MLB Extra Innings free preview is not limited to TWC. According to this site, it's available for DirecTV, FiOS TV, and Comcast/XFinity, and RCN. The DSL is different technology. The service level agreement that the plaza signed with VZ may have something to do with the two day downtime. Once you add a middle man to the equation, all bets are off. At our office, our contract is with VZ. If something went wrong, we would escalate it immediately. Two days down under normal conditions is unacceptable. Were your stores using FiOS or DSL? Our office uses a FiOS business connection and while we had issues getting it set up, we had 100% uptime for the last 2 years with it. Two days without Internet is a big deal. If you couldn't get them to come out, I would consider TWC Business service. Residential and business service are managed separately. 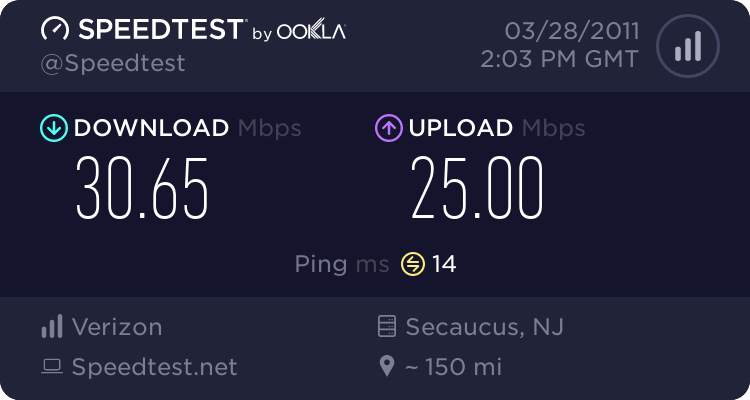 I've had FiOS at home since 2005 or 2006 and I have had only one time where I lost the connection (that I was aware of). That was about 3 weeks ago and apparently the ONT was being remotely updated. I had a service call and the service guy was out that afternoon. The Internet was only down for an hour or two, but I wanted it checked out anyways. My biggest concern with moving from TWC to VZ was the level of service. TWC service was usually pretty prompt. On the other hand, they had to come out to my house too many times to address signal quality issues. I can't judge the quality of their service calls based on a single service, but only having one service call in 5+ years is significant. Verizon's Twitter presence is pretty good. I think TWC has more people manning the Twitter accounts, but I have had prompt responses from @verizonsupport for all of my questions. At this point, I'm leaning towards keeping the VZ Router as the primary (or outer) router. I'm not planning on copying media files to the VZ DVR, I'll keep my toys running on the subnet managed by my Netgear (the inner router). I had to do some tweaking to get my Windows Home Server box connected to the outside world, but that seems to be fine too. Assign a static IP address to the WHS box from the inner router. The OEM firmware in my Netgear router supports this. Set up port forwarding on the inner router to the WHS box. You will need to forward ports 80, 443, and 4125 to the static IP address that you assigned to the WHS box. On the VZ router forward the same ports to the inner router. Run the Remote Access Repair Wizard on the WHS console to verify that the connection is working. That's all I needed to get that to work. You are going to have to split this list out for the FiOS TV users now. AUGH, must have BBC America HD! Gotta watch my Dr. Who, TopGear, and Being Human! Yeah, I'm not happy about losing the HD versions of those shows. But, they are planning on adding BBCAHD, it's just a matter of when. The router is a wireless N model, but I'm going to keep using my Netgear. The VZ router is a single band, I have a dual band. They forgot the cablecard for my TiVO, but they are running one out now. I ended up getting one more STB. I'll have the multiroom DVR (Moto 7232), 3 STBs, and cablecard. They have completed the install. The installer was very knowledgeable and walked me through all of the settings, widgets, and parental controls. I walked him through his first cablecard install. The cablecard install went much easier than it did with Time Warner. He was able to pair the card with an app that he ran on my PC. TiVo still does not have the Bethlehem zip codes associated with FiOS, I used 12205 instead. The UI on the FiOS boxes makes the Time Warner UI look like CompuServe, circa 1986. Easy to use and they have a help channel and VOD help. Until I get used to everything, I'm going to run the routers in the suggested VZ layout. The VZ router goes between the Internet and my network. My Netgeear router is on a separate subnet. Since my router has better WiFi, I turned off the radio on the VZ router. As long as my WHS box can punch a hole through the various firewalls, I''l be set. I did lose one of my favorite channels, BBC America HD. They have the SD channel, but I'll miss the HD channels. I am not the only one complaining about this, hopefully they'll add this. I don't have mine yet, it gets installed on Monday. I bought a new Netgear router last month, I plan on putting it in front of the Actiontec router after the installer has left. You absolutely need the Actiontec somewhere in the configuration, otherwise the Verizon supplied set top boxes and DVR's would be unable to get their data. It's the MOCA bridge from the ONT to the router and from the router to the STB's. There are a few ways of making the Actiontec work along side your own router. DSLReports.com has a FAQ on the various combinations that you can try. I've been watching their forums for while, people are having mixed success with using their own router as the primary. It sounds doable, but will take some time to get it rights. The simplest solution is put your own router behind the Actiontec, on it's own subnet. This is the Verizon supported setup. All of the FiOS TV features will work, but you will be unable to share data between VZ's DVR and your own PC. I will do this until the installer walks out the door. I will try one of the combinations of using my router as the primary and the ActionTec as secondary. There is a crazy combination that uses 2 of your own routers plus the Actiontec. This combination gives the Actiontec the same IP address as the primary router and VZ only sees the Actiontec. That's documented here. I still have my old router, running as an access point and VPN, so I may try this one. This is a temporary situation, but if you are subscribing to FiOS TV in Bethlehem and use a TiVo with it, TiVo does not yet have the Albany FiOS TV listings for Bethlehem zip codes. As of 3/27/2011, Verizon had only provided TiVo with a subset of the zip codes covered by the FiOS TV availability. I called TiVo and they suggested using the zip code 12047. That zip code is in Cohoes, which I didn't think has FiOS, but it will work.